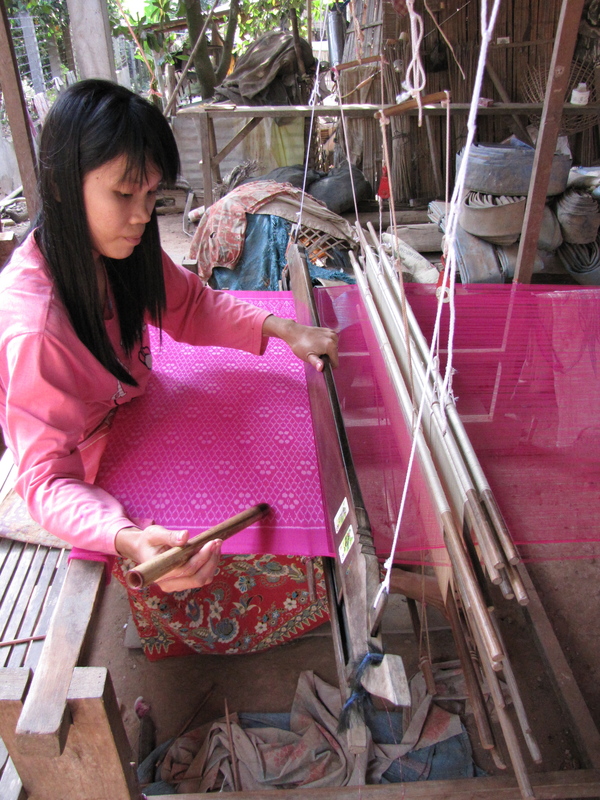 Near Kompong Cham, I visited several weavers in and near the village of Prae Chung Kran, where I had been told hol was being woven. In the first house I visited, hol was being woven in traditional colours with a pictorial design. The women were very welcoming, so eventually I asked if I could try weaving. They looked a little dubious at first, but once they saw how keen I was, they gifted me with a bobbin holding some left-over pattern-dyed weft. 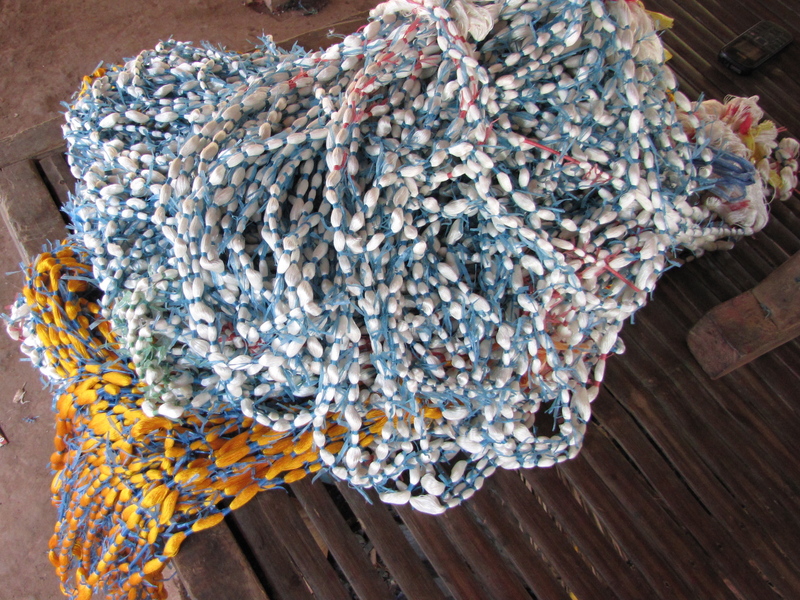 This weaver kept her weft bobbins in order by tying them together with plastic raffia, and then rolling the bundle up, rather than hanging them from the loom. The board holding the warp was held in place with segments of bamboo fashioned from a stem and a trimmed branch, and tied to the back beam. Plastic piping is replacing bamboo on some looms and shuttles. I’m sure it is valued for it’s smoothness & straightness and the fact that it is less likely to crack. These heddles each had an extra floating piece of pipe lying on the warp. Much of the hol I saw here was two-tone, in pinks and purples and blues with white. My translator said that these colours are more popular with the younger Cambodian women. Cambodia has a relatively young population, so I guess the market is demanding these colourways. This woman was using a beautiful bamboo shuttle with a wooden tip. These skeins of silk had just been washed in preparation for dyeing. Weft yarn for hol appears to be thicker and softer than the very fine yarn used for the warp. I asked where the silk was from, and was told it was Cambodian. On further questioning, I found that it purchased from Phnom Penh, and before that it may well have been imported from Vietnam. Several women were also weaving checked fabric, and the two pedals operating the two heddles on their looms were orientated weft-wise, as for the hol loom with 3 pedals. These wooden shuttles being used for the checked fabrics were gorgeously smooth, and I was amused to see a drinking straw being used as a bobbin. This entry was posted in Cambodian Techniques and tagged Cambodia, heddle, hol, Kompong Cham, loom, shuttle, weaving by Wendy Garrity. Bookmark the permalink.